Tyler Bennett trusts no one. Just another foster kid bounced from home to home, he’s learned that lesson the hard way. Cue the world’s tiniest violin. But when strange things start happening—waking up with bloody knuckles and no memory of the night before or the burner phone he can’t let out of his sight— Tyler starts to wonder if he can even trust himself. I wasn’t expecting to like this book as much as I did. See, I really like young adult, mystery, and thriller but I can never find books that have those genres all combined that I actually like. 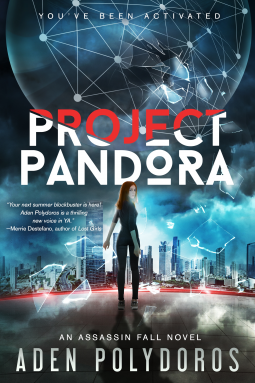 So when I saw the blurb for Project Pandora on NetGalley, my inner antenna went “Hrrmmmm, sounds interesting“. I am glad that I requested the book because it was not what I expected and believe me, that is a good thing. What you read from the blurb is not even half of what goes on in the book. Not even close. There is so much that is revealed in the book that I don’t even think that the blurb could cover it. I was amazed at how easy it was to switch between the storylines too and how the author made some of the chapters as Dr notes/case studies and the actual storylines. What made it easy to distinguish between the chapters was that the author chose to use each character’s code name at the beginning of the chapter. I also liked how the kids matched up with their code names. Take Tyler for instance. His code name is Apollo and every single painting/drawing that I have seen of Apollo, he has been a blonde. Which Tyler was. Shannon was a red-head and as was Artemis. Persephone was always shown as a blonde with blue eyes and Elizabeth is a blonde. Hades…..he is always pictured as a dark-haired, pale man and 2 was just that. Again, it is these little details that really made the book for me. The whole Pandora Project was scary, at least to me, because I have no issues imagining something like this going down. Creating (for lack of a better word) children who will rise to power in the military, goverment…etc is a scary thing. But what scared me, even more, was the description of the sensory deprivation tanks and the horror that Hades and Elizabeth felt when they were going into them. I do wish that more background was given about why the Pandora Project was started. There were hints but nothing that was said outright. Normally, that would have bugged me but seeing that this will be a series, I can’t wait to see what is revealed in the second book. Hades really gave me chills when I was reading his scenes. He was not a bad person but was being molded into a killing machine (or as he put it “evolving“). The torture that they put him through to change him after he tried to escape was horrendous and I am glad that the author only chose to touch upon it. Electroshock, subliminal messages, mind-altering drugs and long stretches of time in a sensory deprivation tank…..no wonder he turned into who and what they wanted him to turn into. But deep down, and this is what got me, there was a small piece of himself that was 2 and a small piece that was horrified at all the killing he did. Tyler and Shannon were not aware of who they were until almost the middle of the book when Tyler broke free from the “training” he received and realized what he was doing. Shannon was having doubts and finally broke free of her “training” when Tyler was able to break her out of her fugue (for lack of a better word). Elizabeth’s realization came at the end of the book and it was almost too late. The end of the book was not a happy ending. Oh no, it wasn’t and the storylines were left up in the air. Which I loved. Listen, I like a happy ever after as much as the next person but sometimes a story doesn’t get that. And in this book, it definitely didn’t. Project Pandora is not a cute teenybopper book where everything is all sunshine and rainbows. Instead, it is a dark, gritty book that keeps you on the edge of your seat for the entire book. This is one book that will be going on my must keep shelf and this is also a book where I will be eagerly anticipating the sequel. Aden Polydoros grew up in Long Grove, Illinois, the youngest of three children. Aden’s family moved to Arizona when he was in second grade. As a kid, he spent much of his time exploring the desert near his home. When he wasn’t searching for snakes and lizards, he was raiding the bookshelves of the local library. His debut novel, PROJECT PANDORA, will be available on August 1, 2017, from Entangled Teen. Suspense wasn’t my first choice either. I requested the book from NetGalley because I liked the cover…lol. But it was a really good story and the ending blew my mind. I can’t wait to read the next book.